Classic dog art falls into four main categories: sporting, breed, portrait, and anthropomorphization, meaning dogs doing things people normally do. Contemporary dog art includes cartoons and artwork created by dogs. George Stubbs (1724-1806), best known for his paintings of horses, was said to have revolutionized the face of dog art with his vast knowledge and understanding of anatomy. Queen Victoria was a dog lover. Her mother commissioned Edwin Lanseer (1802-1873) to paint a portrait of Dash, Victoria's Cocker Spaniel, as a present for her seventeenth birthday. Throughout her lifetime, Queen Victoria commissioned many dog portraits. Although artwork featuring dogs goes back centuries before her time, her influence significantly increased the popularity of dog art, especially portraits of pet dogs. Prior to Queen Victoria's time, dogs in paintings had primarily been represented in sporting scenes. The rise of pet portraits did not diminish the popularity of artwork featuring sporting dogs. John Emms (1843-1912) is one of the most famous painters of sporting dogs. His work commands some of the highest prices from collectors today. When dog owners began breeding show dogs, rather than working dogs, the breed portraits started to emerge. Reuben Binks (1880-1950) was famous for breed portraits and his illustrations documenting dog shows. The most famous dog art is the series of paintings of dogs playing poker by C. M. Coolidge, painted in 1903. Coolidge was hired by Brown and Bigelow, an advertising firm, to paint 16 paintings of dogs in human poses. Nine of the paintings depict dogs playing poker. The paintings have found new popularity as calendars, prints and even rugs. In 2005, two paintings from the series -- "A Bold Bluff" and "Waterloo: Two" -- were auction at Doyle, fetching $590,400.00. The paintings were only expected to sell for about $30,000-$50,000. Doyle has been holding its annual "Dogs In Art" auction every February since 1998. The auction coincides with the Westminster Kennel Club Dog Show. The Bonhams 24th annual Dog Sale, held on February 14, 2006 set a new international record for dog art sales by bringing in almost $1.7 million. Doyle and Bonhams once held their dog art sales together but split up the events in 2003. The William Second Gallery, in New York City, specializes in 19th century dog paintings. They also carry modern dog art. William Second is the world's foremost expert on 19th century dog paintings and has written several books on the subject. The gallery's Web Site contains a wealth of information on dog art and artists. Jerry the Troublesome Tyke, first shown in cinemas in 1925, has resurfaced and was shown at the 2005 London Film Festival. The ever popular Betty Boop was originally drawn as a dog. In 1931, she was transformed into a woman, and Pudgy, Betty's dog, was created. Pluto got his start in 1930, and Goofy made his first cameo appearance in Mickey's Revue in 1932. Snoopy of The Peanuts emerged in 1950. Scooby-Doo, a Great Dane, premiered in 1969. While cats hold the claim to fame as artists, artwork created by dogs is becoming a popular fund raising tool for shelters and rescues. 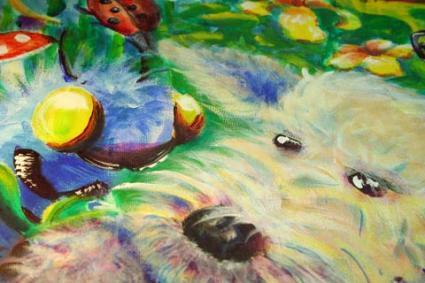 Paintings created by dogs and cats have been sold to raise funds for the Progressive Animal Welfare Society (PAWS). The Arizona Animal Fair features a Puppy Pawcasso booth, where dogs can paint. Proceeds from the booth go to Saving Animals From Euthanasia (SAFE), a non-profit organization. The Ottawa Humane Society's Annual Eukanuba Wiggle Waggle Walkathon features a similar event called Picasso Puppies. Contemporary artwork featuring dogs can be found in all price ranges. While fine art featuring sporting dogs and show breeds is still highly sought after, the gift market has exploded in popularity. Dogs are featured on coffee cups, t-shirts, posters, and calendars. Many loving dog owners still commission artists to paint portraits of their dogs. Even more people are turning to pet photographers and pet portrait studios for pictures of their dogs.